You are here: Home / Food / Recipes / What do you do with pie scraps? You make a Sugar Dog! What do you do with pie scraps? You make a Sugar Dog! When I was a kid my mom used to make these homemade tourtieres each year around Christmas. My favourite part of the whole process was waiting around to see how much leftover pie dough there would be. I’d be hoping my mom would make us kids a “sugar dog” or two. I always worried she would forget. Or that she would somehow use up every last bit of dough in making her meat pies. She never forgot. 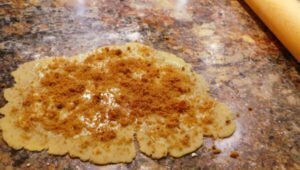 She always scraped up all the tiny leftover pieces of pie dough, rolled them out flat, and then coated the dough in cinnamon, brown sugar and butter. She’d roll it up into this long lean wiener dog shape, curl it into a vague “c”, toss it in a pie pan and put it in the oven to brown. I have fond memories of eating sugar dogs as a kid. I remember some years she let me help her spread the sugar. I remember eating tiny lumps of hot fresh from the oven dough. I remember carefully cutting it up and sharing it with my brother and sister. Never waiting long enough to let it cool, shoving my sugar covered fingers into my mouth and pretending I hadn’t just burnt them. So obviously this year, when I finally convinced my mom to share her tourtière recipe with me, we had to make sugar dogs. It was a must. I probably should have been thinking about sharing the experience with my kids, but I wasn’t. I was just thinking about me. My mom and I were the only ones in the house. I briefly experienced that same sense of unease I would get as a kid. Would my mom (help) me make a sugar dog? Was my mom going to think I was nuts for wanting one? Of course my mom was only too happy to use the pie scraps to make us a treat. “Of course we’ll make a sugar dog.” she said, just like she had said it dozens of times when I was a kid. We rolled out the dough, spread the butter and sugar and popped in into the oven with our pies. 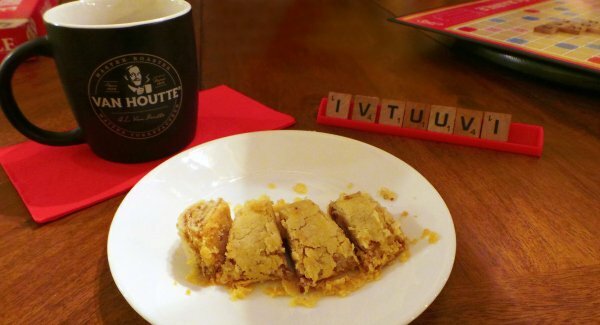 Then we sat and ate warm lumps of sugary dough, drank cups of hot black coffee, and played Scrabble, while waiting for our meat pies to finish cooking. Which, I’ve got to say, is a pretty fantastic way to spend an evening. This is the part where I should share the recipe with you, tell you exactly how to make sugar dogs. But there’s really not that much to it. I’ve pretty much already covered it. — Flour your surface. 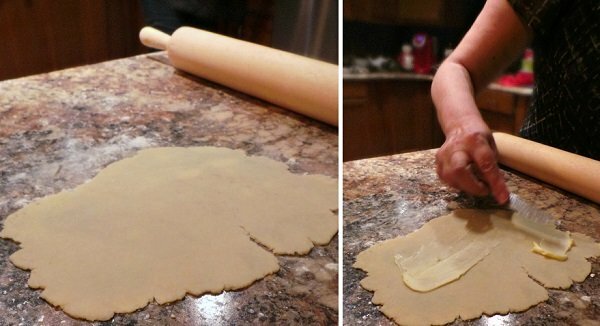 Take the leftover pie dough, lump it together, then roll it out flat. Spread butter over the dough (margarine will work in a pinch, but it really should be butter). Be generous with the butter. Spread cinnamon and brown sugar everywhere, over every inch of that dough. Be generous with the sugar. Then roll the dough up into a long worm (or a wiener dog!). Curl it into a C so it will fit into the pie tin. Put it in a pie plate and toss it in the oven. Bake at 350° until it just starts to turn brown (about 20 minutes). We used premade frozen crust. It was still yummy. 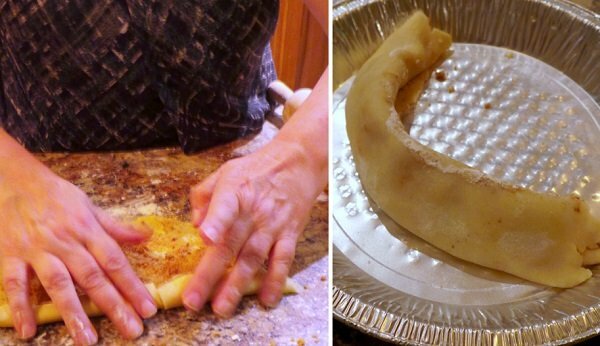 When I was little my mom did the same thing…rolled out leftover dough, spread on the butter, added brown sugar and sprinkled on the cinnamon.. She rolled it up to form a long tube and then carefully cut 1/4 inch slices. She laid them out on a cookie sheet and baked them. We called them ‘Pinwheels’. I’m so glad you shared this with us. It brought back some wonderful memories. It is one year to the week that I lost my mom. Your post reminded me that she would bake the extra pie crust and slather it with butter and let me eat it. thank you. My mom made these for me when I was little! Only she would cut them into little two-bite size pieces so we could see the swirl pattern. This brought back so many memories. It’s now been 8 years since passed to the week. Thank you for reminding me to make these with my young children. Apparently this recipe is really widely spread because I remember my grandma and my mom making these for me but the most important thing is how much I loved eating it every time she made this recipe for me. Oh my goodness, would never have thought of doing this, but just may try it. These look so delicious and I bet the kiddies would love to help make them. Ahh, this brings back memories of my mom. When she had extra crust bits she would twist cheese in them and bake them. Delicious! 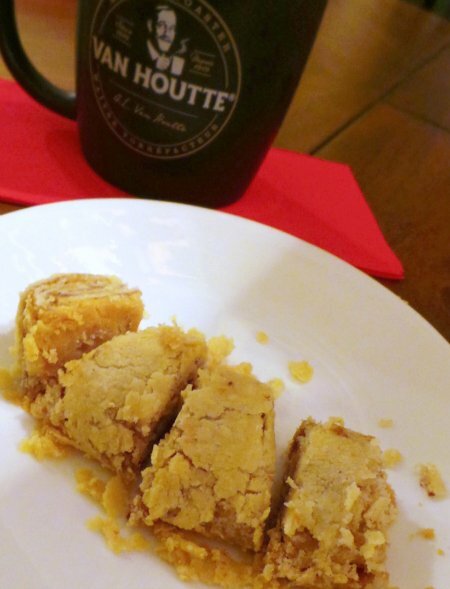 Love making these with the leftover pastry, always a yummy treat! Have never heard of these but they look yummy! What a great idea to use left over dough. Perfect little dessert. This looks so yummy! I love recipes like this that make a special treat with leftovers. 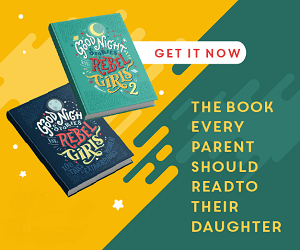 Did your article above bring back memories for me…my sister and I also anxiously awaited pastry scraps with cinnamon and sugar when my Mother was making pies. Yum, such a great idea for the scraps. I have yet to try this and can’t wait.It sounds like a delicious way to use up the extra crust.Thanks for tip. I have never heard of this and always trash the left over bits! I’ll definitely do this next time! Thanks.